Gucci on Wheels! – Sooo Fabulous! Gucci has teamed up with Fiat to launch a car. But it’s not the brand’s first foray into the auto world. The American Motors Hornet in 1972 and the 1979 Cadillac Seville were redone Gucci style decades ago. 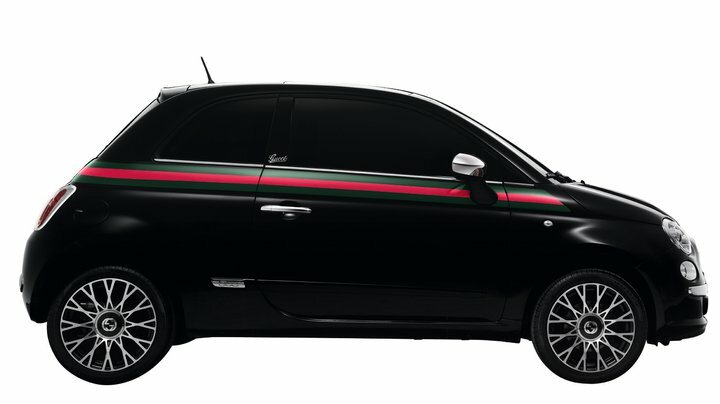 The 21st century Gucci ride is available in sleek black or pearl white, with the signature red-green stripe running along the entire exterior. What we don’t see from the photos is the stripe’s continuation inside on the seats and seatbelts. Plus, the interior features contrasting ivory and black, with a bi-color steering wheel and two-tone leather seats sporting the unmistakeable ‘Guccissima’ print. Previous PostLady Gaga Takes Over Barneys for ChristmasNext PostGreat Lash Birthday Bash!